Doctor Who is a long running science fiction television programme produced by the BBC which first aired in 1963 and still graces our television screens today, the show was originally cancelled in 1989 but returned to the BBC in 2005 making it the longest running and most successful science fiction series in television history. Without the Daleks it is arguable that the series of Doctor Who would never had made it past the first season, it was the huge success of these alien creatures that cemented the history of this now legendary science fiction series. The Daleks were created by Terry Nation and designed by Raymond P Cusick and have become an important part of British popular culture, the word Dalek can even be found in the Oxford English Dictionary. The Dalek featured here is an original made in 1984 from new moulds created by Martin Wilkie, son of legendary BBC effects designer Bernard Wilkie. 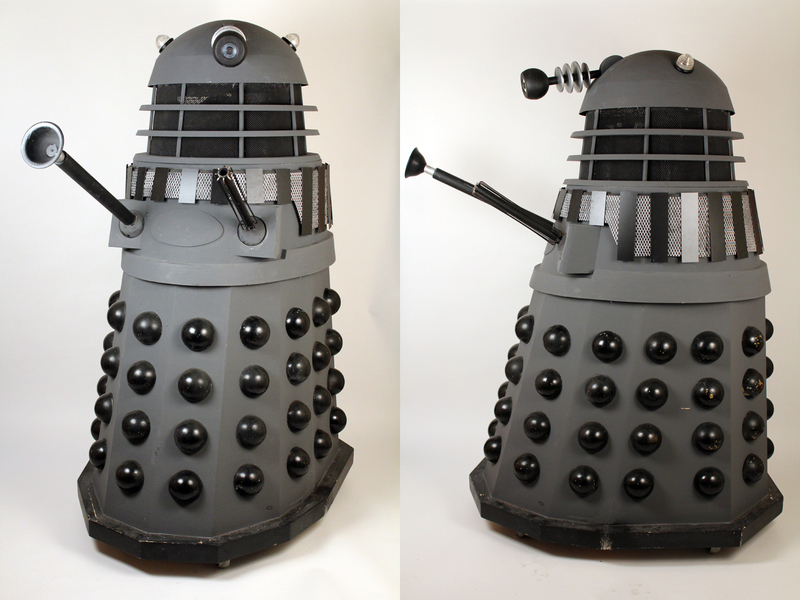 The design differs slightly from the original 1960’s Shawcraft Daleks having a skirt that was steeper with smaller hemispheres spaced further from the skirts top and bottom edges. The fender section is moulded to the bottom of the skirt with a double staged section with the lower half being recessed. The shoulders are moulded to include a lower collar and gun boxes making them slightly shorter and broader than those seen on earlier Shawcraft Daleks. The neck bin is constructed from wood and is very similar to the Shawcraft design as is the dome. Four of these new props, termed 'Necros Daleks', were created and used in the 1985 serial Revelation of the Daleks starring Colin Baker as The Doctor, they sported a white paint finish with gold hemispheres and were very unlike any Dalek we had previously seen on our television screens. The prop was subsequently used in the 1988 serial Remembrance of the Daleks starring Sylvester McCoy as The Doctor, albeit in a slightly different combination to Revelation with the skirt and shoulder sections of two of the 'Necros' Dalek casings having been mixed up and reverted to a more classic renegade paint scheme. Inside the Dalek there are large number 4’s sprayed in both the shoulders and the skirt so that the operator would know which Dalek he is when being directed during shooting. 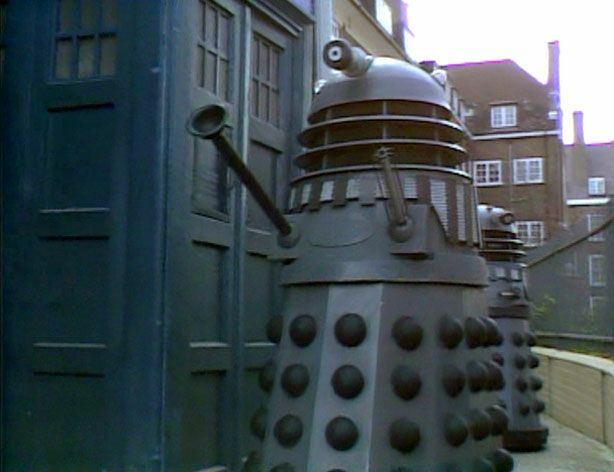 This particular Dalek can be clearly spotted on screen as it is the only Dalek with a grey lower collar, it is the first Dalek we see in Remembrance of the Daleks as the army do battle with it in the famous Totters Lane junkyard. 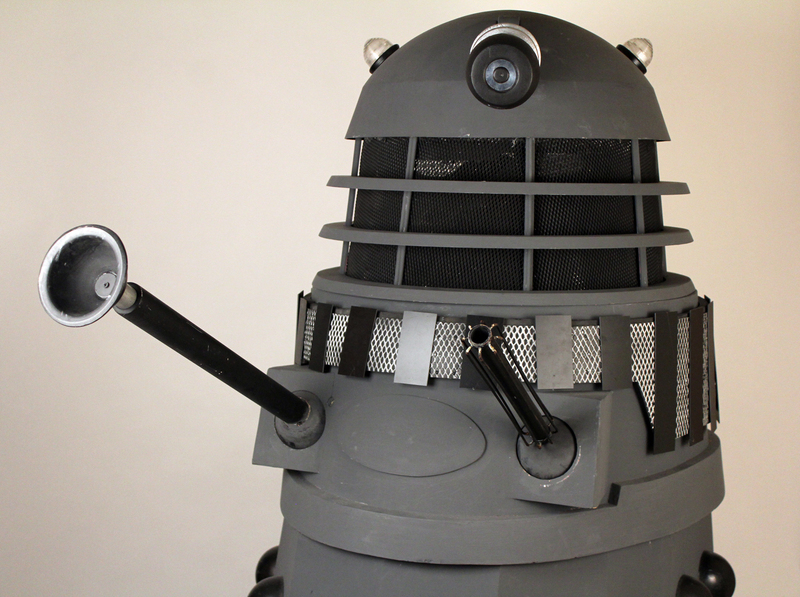 This Dalek and the other aforementioned 'Necros' prop previously used in Revelation largely took priority over the other, more dishevelled, renegade casings with four brand new Dalek props created from the moulds to represent the imperial faction. After the show the prop unfortunately fell in to a state of disrepair but has since been carefully restored by BBC Visual Effects Department veteran Mike Tucker, now of The Model Unit, ensuring the survival of this important part of British television history. 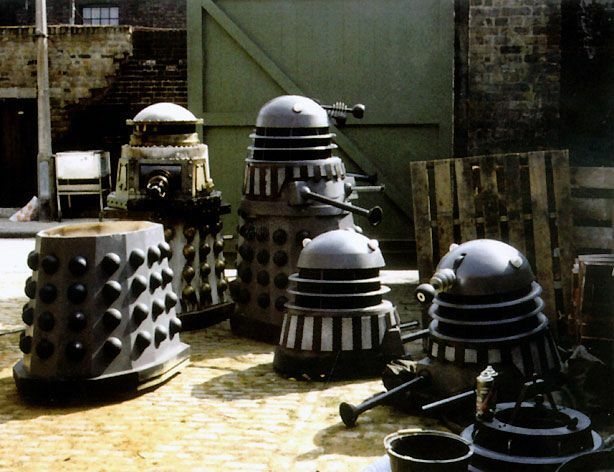 Arguably the most important props in the history of the series, the Daleks are recognised by millions of people across the globe spanning generations of viewers and they will forever be remembered as an iconic image of the 20th century.